For users of LiveLink™ for MATLAB®, COMSOL Multiphysics® version 5.2a offers several improved wrapper functions. Review all of them in detail below. The mphplot wrapper function supports the following plot types, new in COMSOL Multiphysics® 5.2a: Directivity Plots (Acoustics Module) and Optical Aberration Plots (Ray Optics). 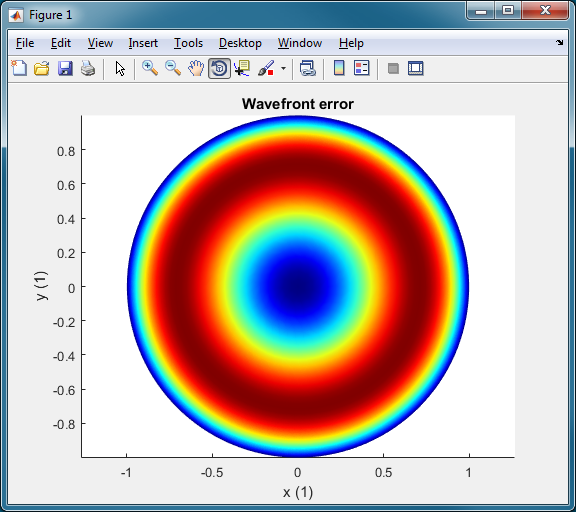 Additionally, new color tables added in COMSOL Multiphysics® 5.2a are included as options for the mphplot function: AuroraAustralis, AuroraBorealis, HeatCamera, HeatCameraLight, JupiterAuroraBorealis, and Twilight. Furthermore, the mphplot function now includes 2D Tube Plots and wireframe rendering for Volume Plots. Additionally, surfaces and lines are ordered such that lines appear on top of surfaces, while filled legend types are available with the mphplot function. 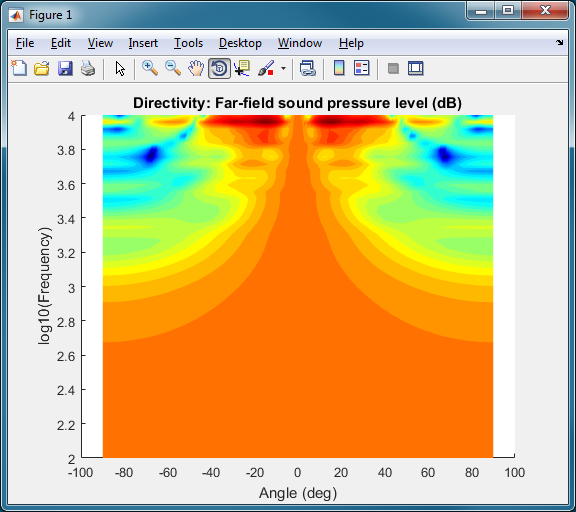 Directivity plot for a lumped loudspeaker driver model. The mphevaluate function now accepts expressions as a vector matrix. Results are returned as an array that is the same size as the expression. Additionally, a new option, asvalue, has been added to return results as an array of structs or, alternatively, as a cell array of strings. The trans option now supports additional values for matrix transformation. These new values are maxwellmutual and mutualmaxwell, in addition to none, inverse, sy, sz, ys, yz, zs, and zy. You can now specify at what step in the solution sequence the matrices should be extracted using the mphstate function wrapper function. Using the new property, extractafter, you can extract the initial load vector before running the solver. Then, matrices can be manipulated and reinserted with mphinputmatrix. Error and warning nodes as well as icons for all nodes are now displayed in the model tree. This makes it easier to navigate the model tree, since it looks similar to the model tree in COMSOL Multiphysics®. The new buttons Copy set and Copy get copy text to the clipboard that directly show how settings can be retrieved from a model (using one of the many get methods) and how its value can be changed (using the set method). 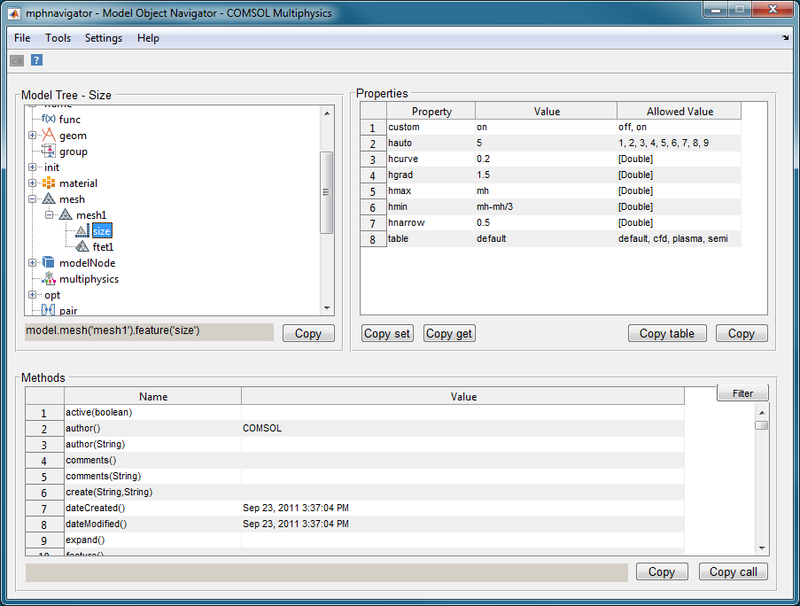 The mphnavigator function, showing the mesh settings for the busbar model. Notice the Copy set and Copy get buttons that make it possible to copy set and get statements to the clipboard for use in scripts and on the command line. Multiple levels of errors are extracted from models to give a better overview of any errors in the model and their origin. An extra column is added to the output. This column contains a cell array of the model tree nodes that contain the error information. Having this information makes it easier to extract error information for automated processing of error and warning conditions.